The General ever desirous to cherish virtuous ambition in his soldiers, as well as to foster and encourage every species of Military merit, directs that whenever any singularly meritorious action is performed, the author of it shall be permitted to wear on his facings over the left breast, the figure of a heart in purple cloth The road to glory in a patriot army and a free country is thus open to all. With these words, General George Washington of the Continental Army commissioned the Badge of Military Merit on August 7th 1782. The medal was awarded to three noncommissioned officers of the Continental Army, each receiving the award directly from General Washington himself. 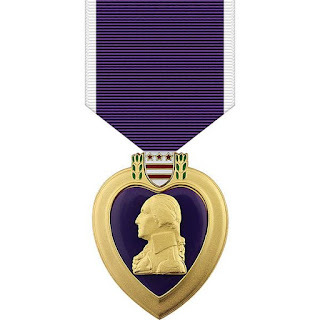 In 1932, the United States War Department (precursor to the current Department of Defense), authorized a new medal, the Purple Heart Medal, to be issued to soldiers who had received either the Meritorious Service Citation Certificate, Wound Chevron or the Army Wound Ribbon on or after April 5th, 1917 the day prior to the United States entering the First World War. After the creation of the Legion of Merit, the Purple Heart has only been awarded to those who have received wounds in military service. The medal had been designed at the direction of Army Chief of Staff, General Douglas MacArthur, by Army heraldic specialist Elizabeth Will. Her design has withstood the test of time, and serves as a testament to General Washingtons orders concerning the Badge of Military Merit. The War Department designated the Purple Heart Medal as the official military decoration to succeed the Badge of Military Merit, making it the oldest award given to members of the United States Military. This past week, we celebrated the Purple Hearts 236th birthday. Over 5,000 Illinois veterans have been awarded the Purple Heart. These and others like them are the people General George S. Patton was talking about when he said, The real hero is the man who fights even though he is scared. Thank you to the brave men and women who were wounded in their military service. You served the cause of freedom, and we are grateful for your example and sacrifice. For those who dont know, Saturday August 11th is Freeport Cruise Night. In the late 70s, the Freeport Street Machines, a local car club, sought permission from the city to have a cruise through downtown to demonstrate the hard work their members put into their cars. This year marks Cruise Nights 40th anniversary, and it is expected to be a huge event, with thousands of show vehicles and nearly 11,000 people. If you havent been to Cruise Night, this year is the year! Its hard to believe summer is almost over. Now is the time many of the bills passed during the Legislative General Session are signed by the Governor. I was pleased when Governor Rauner signed House Bill 4476, a bill I sponsored to remove the requirement that a person cited under the Illinois Vehicle Code sign a ticket for a petty offense. The bill also ensures that out of state traffic violators are subject to the same legal process as Illinois residents if they fail to appear for their assigned court date. The Illinois State Police (ISP) and local departments spends thousands of dollars annually for the paper required for an alleged violators signature. To put this in perspective, the ISP issued 151,379 citations in 2016 alone. HB4476 is a common sense solution that will produce cost-savings for state and local governments while increasing officer safety. Legislators are preparing for the Veto Session. Far too often, government emphasizes politics instead of people, power instead of principle. It is important for public officials at every level of government to remember - not all of us have the luxury of a multi-billion dollar family inheritance. Most of us have to work for a living and make our own way. I believe that we need common sense solutions that reward our Midwestern values of hard work, dedication, creativity and entrepreneurship. We have talked about many area businesses and ventures that exhibit those very values in the past few weeks. I believe there are countless more people in Northern Illinois with the same values, starting businesses, or with ideas about a new business. And many of them could use a little help. My ongoing commitment is to pursue common sense solutions to help create good jobs, increase opportunity, and strengthen people in Northern Illinois and through the rest of the state. I do not think small businesses should have to struggle while Springfield is focused on incentivizing a large city to the east of us. I think we can do better. I think we should do better because working families deserve it.